When Heather Huckett fell in love with Nickolas Mueller, she thought he was too good to be true. He made sure to open doors for her, bought her lavender roses and lilies, and liked spending time cooking and cuddling with her in their apartment in Savannah, Ga. The 27-year-old described falling in love with the soldier, whom she met in September 2008, as a whirlwind experience. On Monday, she and more than a dozen of his family members and friends gathered at Arlington National Cemetery to say goodbye to her first love, Sgt. Nickolas A. Mueller, 26, of Little Chute, Wis. He and six other soldiers were killed Oct. 26 when a helicopter they were aboard crashed in Darreh-ye Bum, Afghanistan. Five of the soldiers, including Mueller, were from the 3rd Battalion, 160th Special Operations Regiment (Airborne) based at Hunter Army Airfield in Savannah. Huckett and Mueller met when he showed up at her family’s annual reunion on Tybee Island, off the coast of Georgia. He and her brother were from the same unit. After the brief meeting, Huckett and Mueller began exchanging e-mails. By March, Huckett’s infatuation with the soldier motivated her to move more than 2,700 miles away from her home in San Francisco. After only two days together in Georgia, the couple, then both 26, decided to begin dating and move in together. She must now return to their Savannah apartment alone. Mueller’s clothes still hang in their closet, she said. On Monday, Huckett, in a black dress, sat just feet away from Mueller’s silver coffin. Mueller joined the Army in June 2004. After basic training, he continued to individual training and served two years repairing helicopters with the 252nd Aviation Battalion at Camp Humphries, South Korea. In 2007, he joined Special Operations as a flight engineer. He reenlisted in the Army twice and was on his third deployment to Afghanistan when he was killed. Small toy fighter planes and flight decorations still line Mueller’s room at his parents’ home in Wisconsin. “He said his dream was to be a pilot and be in the Army forever,” his mother, Sharon, said. “He was living his dream. He loved the service. He loved being deployed.” His father, Larry, and his grandfather also served in the military. His older brother, John, 29, remembered Nickolas as upbeat. “He was always the one joking around — always making people laugh,” he said. On Nov. 7, more than a thousand people gathered for a memorial service at Little Chute High School, from which Nickolas Mueller graduated in 2002. Many described the fallen soldier as a generous and caring person whose willingness to help anyone in need will be sorely missed, his mother said. Two months before his death, friends and family say, he decided to take an early deployment date — the end of September instead of October — to be home for Christmas. His mother and girlfriend said that he and Huckett had planned to get engaged over the holidays. Mueller had been in Afghanistan for about a month when the crashed occurred. Despite being thousands of miles away, he had remained close to Huckett and his family. Mueller called his girlfriend every night and his parents at least once a week. During his last conversation with her, Mueller gave Huckett a subtle warning of the danger of his next mission. Huckett said she asked her boyfriend to warn her if he would be going on dangerous missions by saying he would be traveling. Two days later, he joined the thousands of other soldiers who have given their lives in service. 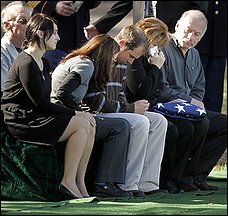 He was laid to rest in Section 60, where most of the casualties of the wars in Iraq and Afghanistan are buried.